Halloween is the second biggest commercial holiday in America. Millions of people celebrate the holiday each year, but its origins are obscure. Some view Halloween as simply a time for fun with friends and family. Others see it as superstitious in nature because of its symbols of death and supernatual horror. Some religions even view it as an unholy holiday. But, whatever your view, here is the fascinating story of the many rivers that converged to create Halloween. The origins of Halloween can be traced back to the ancient Celtic festival of Samhain. Samhain is pronounced "sah-van", although many neo-Pagans pronounce it as " sow-in" (where "ow" rhymes with "cow"). In Gaelic, "sam" means summer and "fuin" means "end." So, "Samhain" means "end of the warm season." Two thousand years ago the Celts lived in the areas that are now Ireland, the United Kingdom, northern France, and Germany. They celebrated their New Year on November 1 each year. This was the day that signified the end of summer along with the end of the harvest and the beginning of the dark, cold, and often fatal winter. The Celts believed that during the transition to the New Year, the boundary between the worlds of the living and the dead could intermingle. They began celebrations at sundown on October 31 to ease this transition. Though scant evidence has been found, researchers believe that during the celebration Druids would build huge bonfires for the people to gather around. They would the burn choice parts of their crops and livestock as offerings to the Celtic deities and ask for protection during the coming cold season. When the festivities were over, they re-lit their hearth fires from the sacred bonfire. Belief in elevated spirit activity led to attempts to make predictions about the future. Consulting the dead was an important part of the celebrations. Since the people were entirely dependent on the unpredictable and sometimes unkind, natural world, they sought for comfort and direction in prophecies and fortune telling games. They feared that the ghosts of the dead who returned could cause mischief, misfortune, and damage to crops. The Celts wore costumes made from animal heads and skins to avoid being recognized by the spirits of the dead. They hoped that the spirits, intent on mischief, would be fooled into passing them by. They also set out bowls of food to appease the ghosts and prevent them from entering their homes. This could be where trick-or-treating originated. By 43 A.D., the Romans held power in the Celtic lands and, during the course of the four hundred years they ruled, two festivals of Roman origin were combined with the traditional Celtic celebration of Samhain. The first was Feralia, a day that started out in February that was intended to give rest and peace to the dead. The Romans made sacrifices to honor the dead and said prayers for them. The second was a day to honor Pomona, the Roman goddess of orchards. Her symbol was the apple, and the incorporation of this celebration into Samhain probably explains the tradition of "bobbing" for apples that is practiced today on Halloween. By 800 A.D., Christianity had spread to the Celtic lands. Around this time, Pope Boniface IV designated November 1 All Saints' Day, which was a time to honor saints and martyrs. 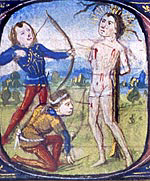 The faithful were admonished to spend their time contemplating the gruesome ways that Christian saints had been tortured to death and how they themselves might be called to martyrdom someday. The celebration was called All-hallows or All-hallowmas (from Middle English Alholowmesse meaning The Feast of All Saints) and the night before All-hallowmas, the night of Samhain, began to be called All-hallows Eve, eventually becoming Halloween. Even later, around 1000 A.D., the Catholic Church named November 2 All Souls' Day, to honor the faithfully departed. 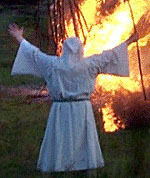 It was celebrated similarly to Samhain, with big bonfires, parades, and costumes of saints, angels, and devils. Eventually all three celebrations were put together, the eve of All Saints', All Saints', and All Souls', into one event called Hallowmas. Carving Jack-o-lanterns is a tradition that came from the Celts—they carved skulls and lanterns out of turnips. The legend starts with a man named Jack, who was a notorious drunk and practical joker. Jack was said to have tricked the devil into climbing up a tree. He then carved an image of a cross into the tree’s trunk and trapped the devil in the highest branches of the tree. Jack made a deal with the devil that said if he would never tempt him again, he would promise to let him down. Legend says that after Jack died he was denied entrance to heaven because of his sins. Jack was then denied entrance into hell because of the trick he had played on the devil. Instead, the devil gave him a single ember to light his way through the cold, dark winter. Jack placed the light into a hollowed out turnip so it would burn longer. The earliest written evidence of a Jack-o-lantern is an entry in the Oxford English Dictionary in 1663. The earliest written account of pumpkins being used for Jack-o-lanterns on Halloween was in 1866 in the Daily News (Kingston, Ontario, Canada), where youngsters of the city "sacrificed pumpkins to make transparent heads, lit by tallow candles". Other countries also celebrate "Death-themed" holidays around the same time. 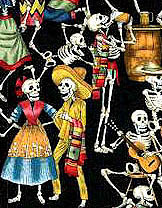 In Mexico it is called Dia de los Muertos, or Day of the Dead, which coincides with All Souls’ Day and blends Catholic and Native American traditions. Mexicans decorate their homes and the graves of their relatives with paper skeletons, and set out food for wandering spirits. In England, Guy Fawkes’ Day has largely taken the place of Halloween. It is celebrated on November 5 as a patriotic holiday. Revelers go door to door with a straw effigy of saboteur Guy Fawkes and ask for, "a penny for the guy" then spend the money on fireworks and candy. The effigy is then burned on a bonfire. 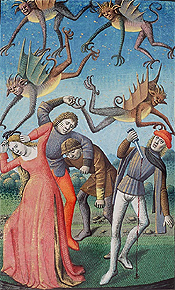 The holiday has a gruesome origin. Guy Fawkes and his conspirators attempted to kill King James I of England, his family, and most of the aristocracy by blowing up the House of Lords in what came to be called the Gunpowder Plot. They failed when one of them sent a letter of warning to a Catholic friend in Parliament. On November 5, 1605, Fawkes was caught in a cellar under Parliament, about to light the fuse on 36 barrels of gunpowder. Fawkes was tortured for three days before he confessed and revealed the names of the other conspirators. After his trial he was tortured again and executed publicly on January 31, 1606. The holiday commemorates the Crown's victory over anarchism. In an ironic twist, Guy Fawkes has come to be viewed as a rebel hero and is said to be "the only man to ever enter parliament with honourable intentions." So, from its beginnings to now this fall holiday, in all its various guises, has been a time to mock and revere the things that frighten us—whether they are death, ghosts, demons, torture, or even terrorists. Its as though our ancestors looked at their bountiful harvest, bulging storerooms, and safe, warm dwellings, and said, "Oh, Winter, you can't harm us. We spit in your face." And though we have tamed our environment, we still have a need to square our shoulders against the unknown because, in the end, its still our nature to invent evil out of shadows and find courage through humor so we, too, can spit in the face of Death. If you want to add this article to your list of favorites or email it to a friend, please use this permanent URL, https://stores.renstore.com/-strse-template/0708B/Page.bok. Permission is granted by the author to quote from this page or use it in handouts as long as you include a link back to Renstore.com.